Award Winning Auctioneer, as seen on Storage Wars Texas. 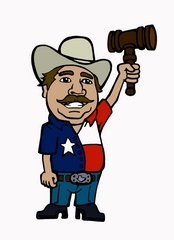 Walt Cade Auctioneer Licensed in Louisiana and Texas. All types of auctions. Considered the "Best in the West" and one of the most sought after auctioneers. Walt preforms hundreds of Auctions per year. While best know fo storage Auctions, benefit auuctions and many others are attracted to this new age and class style of marketing.